Memphis is hot right now. And I don’t mean just temperature wise. We are getting ready for Memphis in May, a month long celebration on the banks of the Mississippi River. Since 1990, Memphis has been hosting the Beale St. Music Festival and more recently the World Championship Barbecue Cooking Contest. And The American Queen Riverboat now docks in Memphis. You’ll be able to board in Memphis and cruise on the Mississippi and Ohio Rivers with stops in Chattanooga, Louisville, Pittsburgh and New Orleans.The Memphis Grizzlies, our NBA team are in the playoffs this season. Go Griz! So now is the time to follow Marc Cohn’s advice to go “Walking in Memphis”. 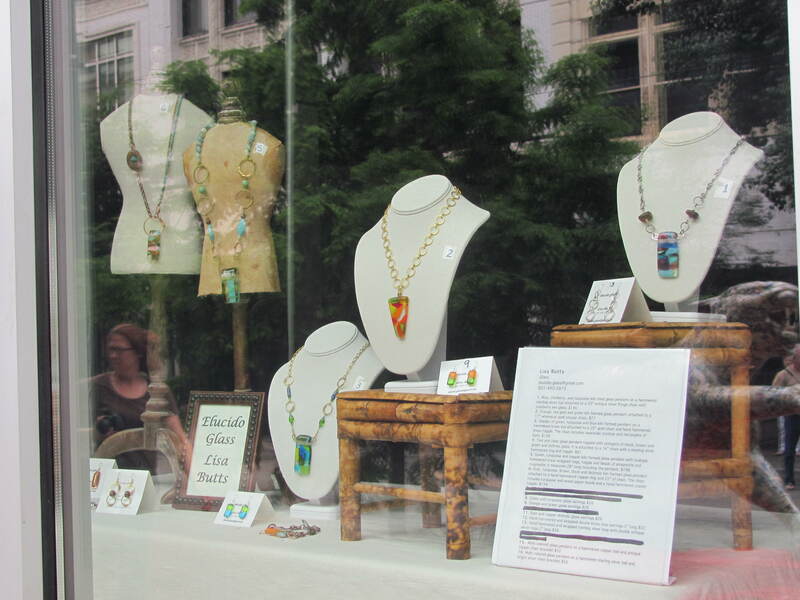 And when you are downtown, check out the storefront at 75 So. Main at the corner of Union. 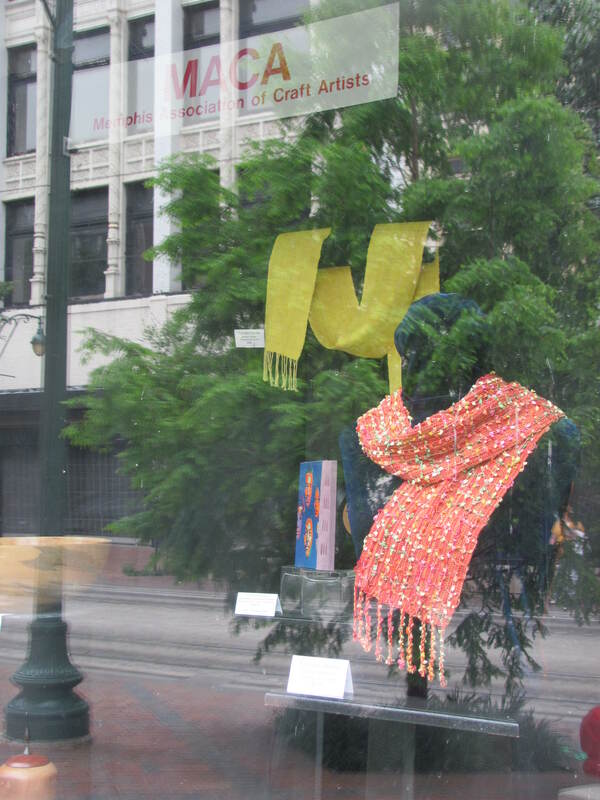 The Downtown Memphis Commission is sponsoring the work of local artists that will be exhibited in downtown windows on the trolley line. 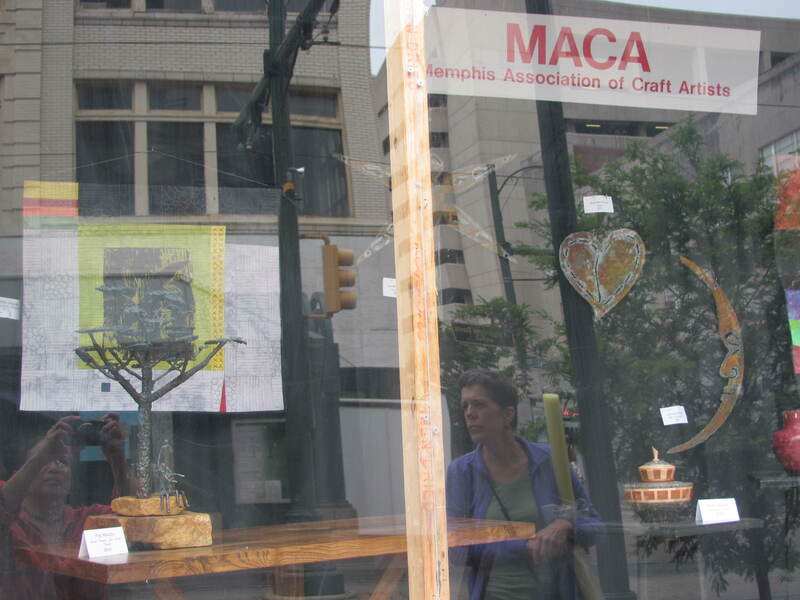 Members of the The Memphis Association of Craft Artists are exhibiting their work in the windows at this location. So if you are headed downtown, whether it is to take part in a Memphis in May event, a basketball game, or to enjoy one of the many fine restaurants in the area, take a moment to see what local craft artists have been working on. 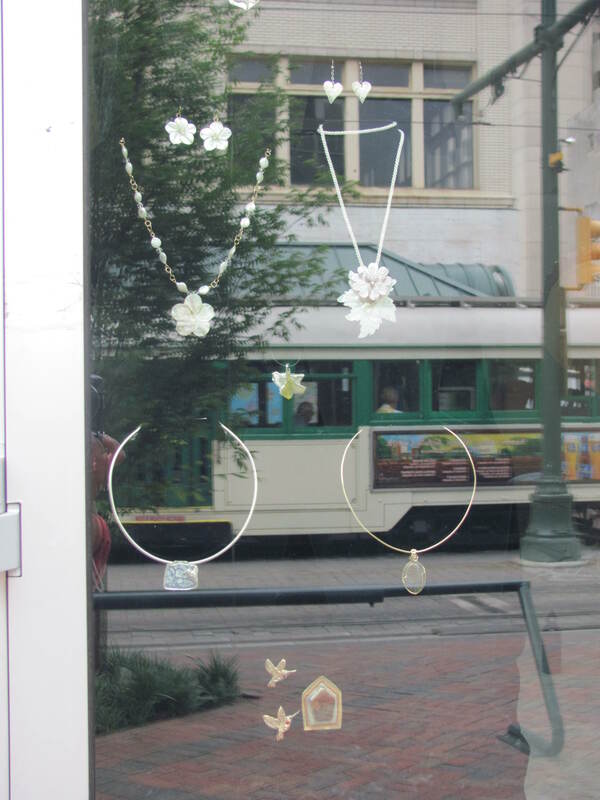 Here is a glimpse of the work displayed in the downtown windows. Some of the artists whose work you will see here are textile artist Marilyn League, jewelry artist Mildred Schiff of DreamCasters Originals, glass artist Lisa Butts of Elucido Glass, Cheryl Hazelton of Studio Woodworking, and MemphisWeaver’s own handwoven scarves and handbound books. 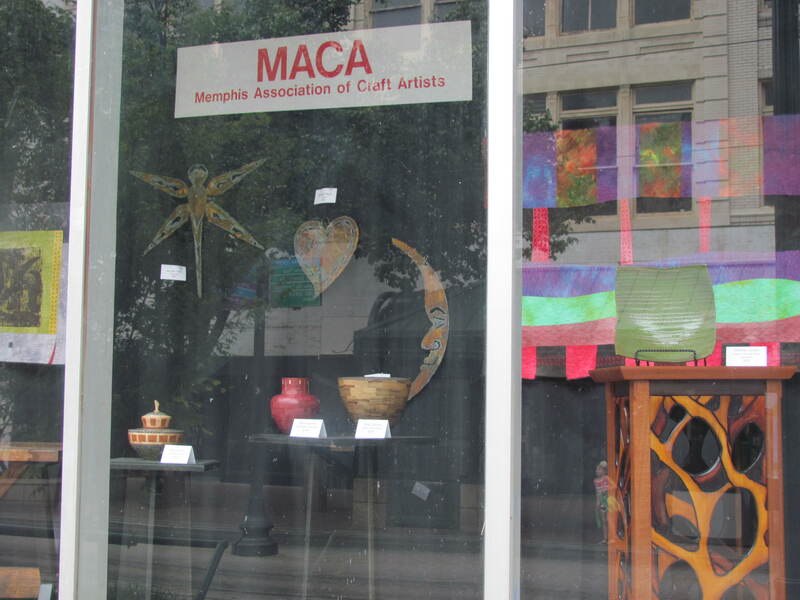 Many of the other artists whose work are on exhibit in the Downtown Windows can be seen on the MACA website. 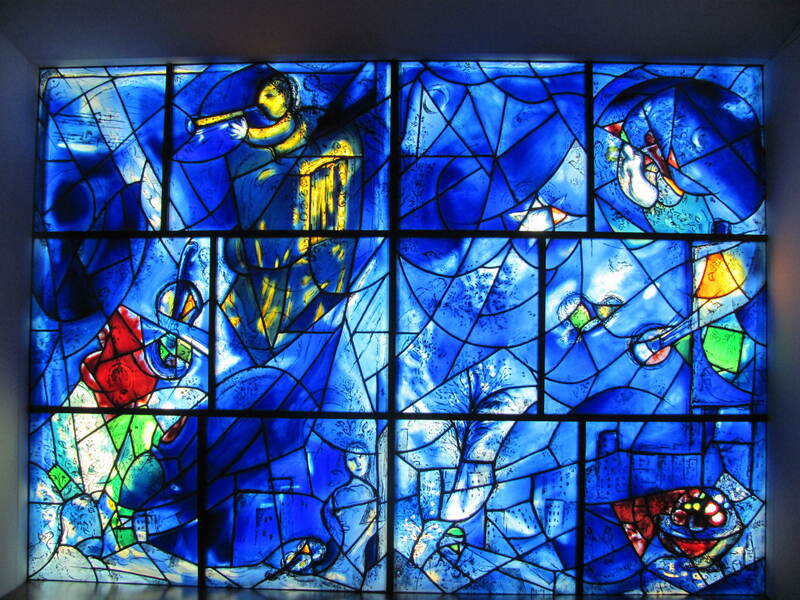 Indeed, walking in Memphis will reveal the delights of a world class city. Turkey Scratch, Arkansas is just a few miles across the Mississippi River from where I am now sitting in Memphis. It is where Levon Helm grew up amid the cotton fields and the fiddlers playing a blend of gospel, country and hillbilly music that would eventually find its way to Memphis and evolve into the blues, rockabilly and rock and roll. 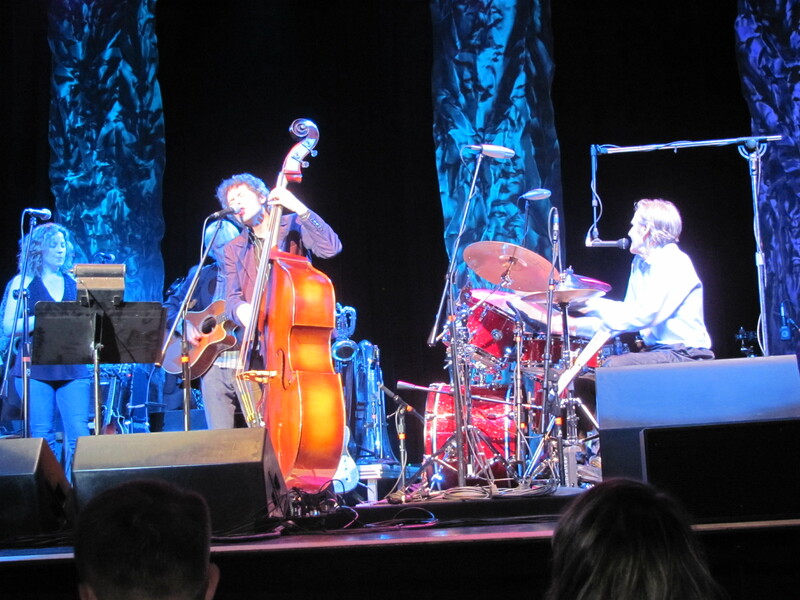 Levon and The Band defined the music of my generation in the 60’s and 70’s. He provided the foundation that contributed to my growth as a human being as much as my family of origin did. Growing up near Boston, Massachusetts was as far removed from Turkey Scratch as one could be in 1968. But it was Levon and his generation of musicians that played a vital role in my upbringing. And it was my brother and the legacy of his tragic death in 1966 that left me hanging on to the music he loved. The music we shared was a way for me to stay connected to the memory of our listening to the tinny sounds of Motown and Bob Dylan on his transistor radio. My brother was also a guitarist and I still have and treasure the sheet music that he used to learn to play some of his favorite songs. 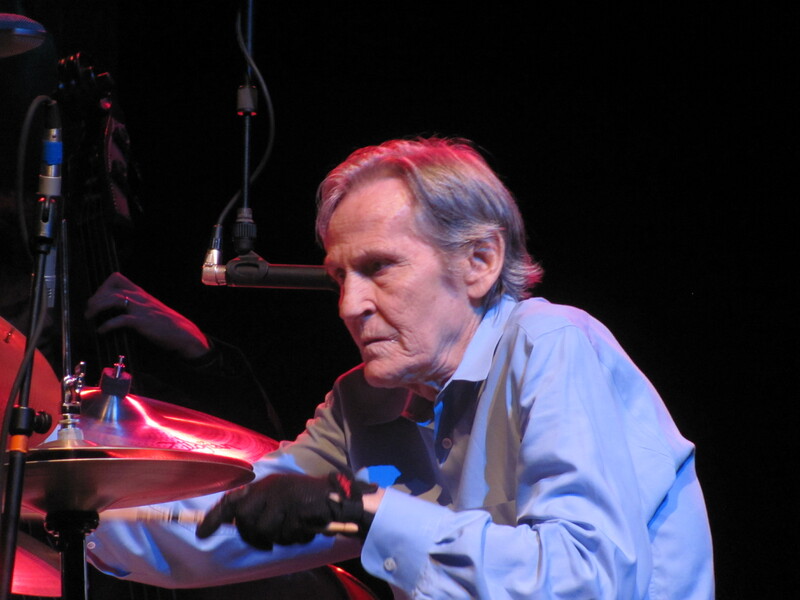 And that is how I fell in love with the music of Levon Helm. 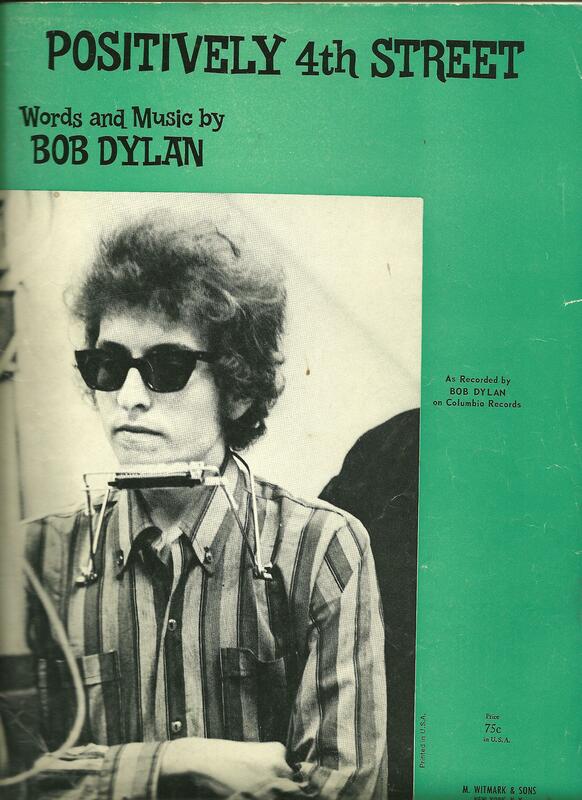 As I grew up listening to the music that my brother would have loved, I found that I always gravitated back to the sounds of Bob Dylan, and eventually “The Last Waltz” became my favorite album of all time. 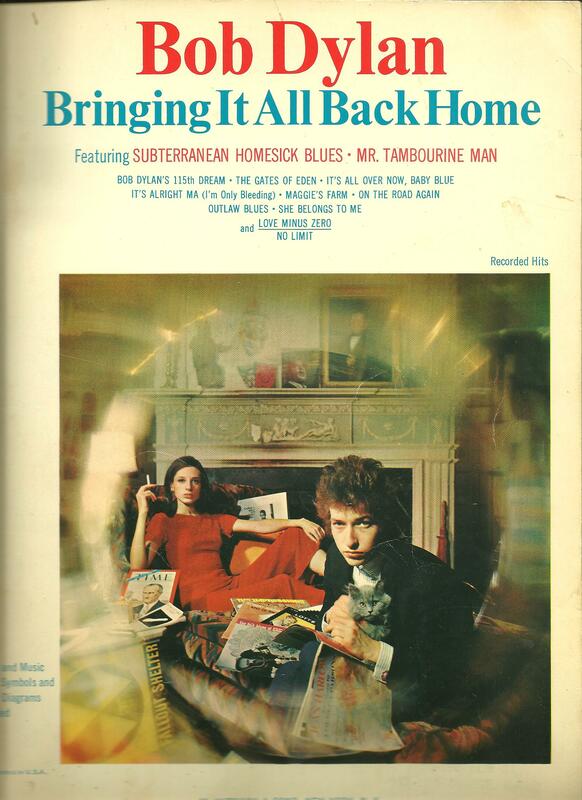 All the artists featured on the album were those that defined my generation: Bob Dylan, Eric Clapton Joni Mitchell, Neil Young, Emmy Lou Harris. And of course the fine band that played with them. I regret that I never went to a Midnight Ramble, most notably the Ramble at the Ryman in 2008 just up the road in Nashville. 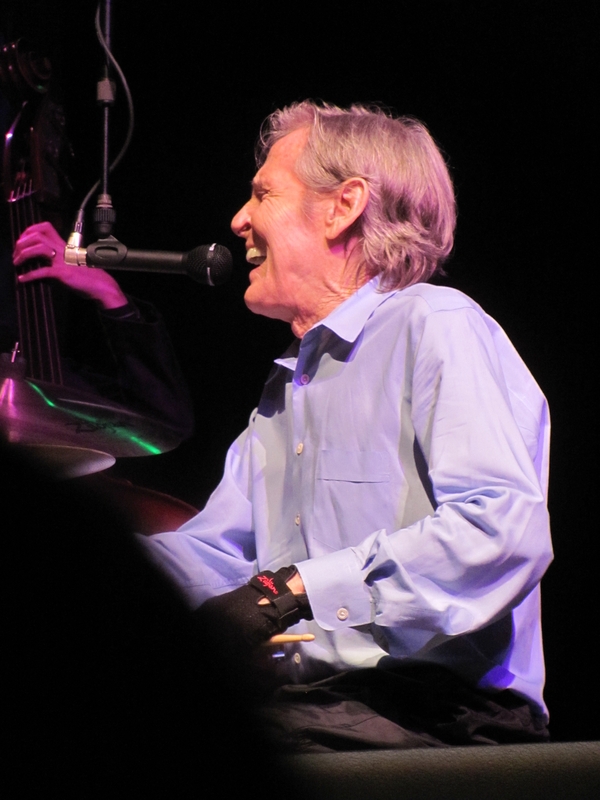 But I was fortunate enough to see Levon Helm and his band, including his daughter Amy perform in Tunica, Mississippi two years ago. And it was a memorable performance. And so that is how I will remember Mr. Helm. Playful and serious as a performer and always, always talented. 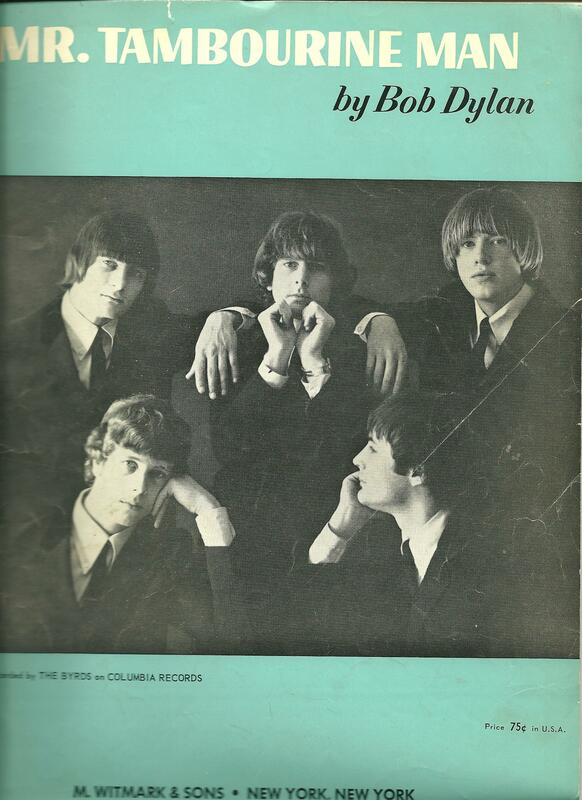 Thank you for the music that will forever remind me of the early days in 1966 – sharing a love of music with my brother that became the seed for embracing the music of my generation. The color palette for my handwoven scarves seems to be changing lately. My scarves this spring are not as dark and muted as my previous scarves. This year the colors are lighter, somewhat pastel, but also with a smattering of jewel tones. This change may be due to the fact that here in Memphis, we experienced unusually warm weather in March. 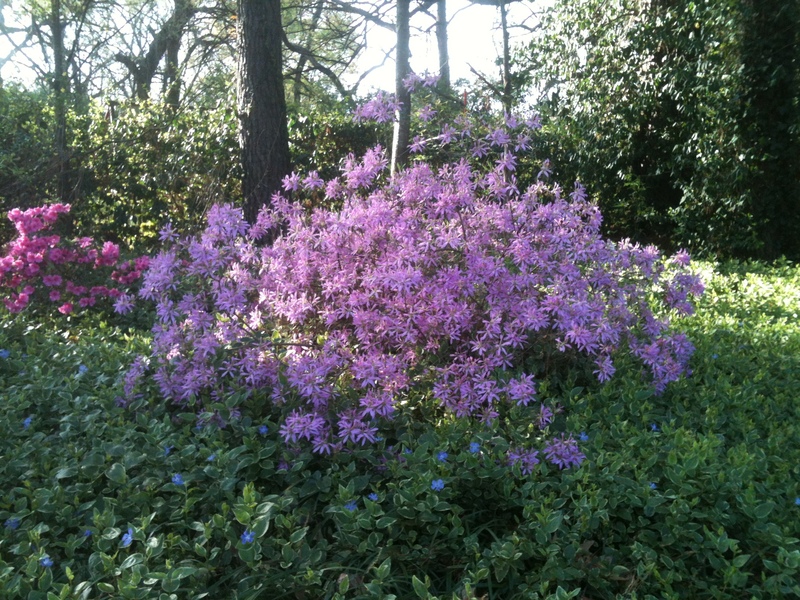 Our azaleas, dogwood and hyacinth appeared suddenly well before the first day of spring. 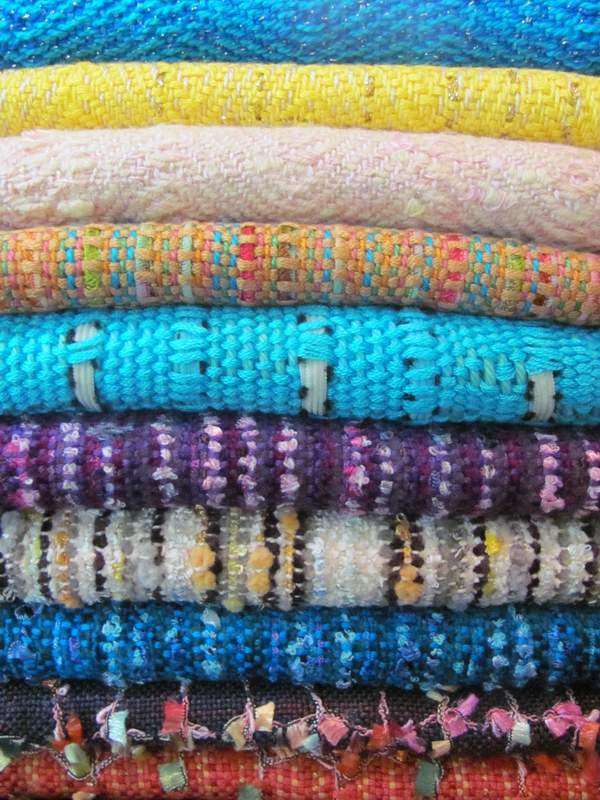 And so in March I have been weaving lightweight scarves that can be worn year round as I prepare for the Spring Show. 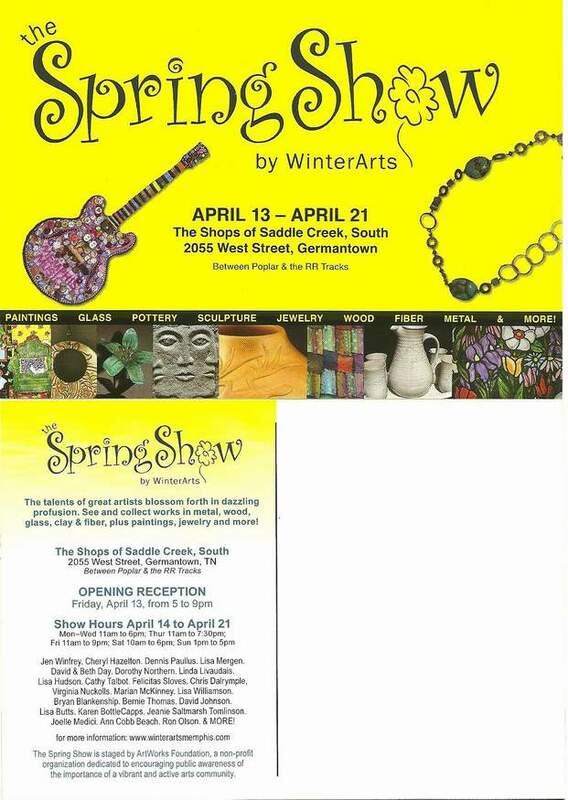 Once again our collective of local artists and craftsmen will be exhibiting and selling our work at the Shops of Saddle Creek in Germantown, TN – a location that has worked well for us the past two years. Beside my handwoven scarves, I plan to sell more of my handbound books including blank books made from 45 rpm vinyl records. And this year, there will be some Elvis sightings. But I digress. Here is the color palette that I have been working on with this most recent series of scarves. I’ve seen these colors somewhere before. 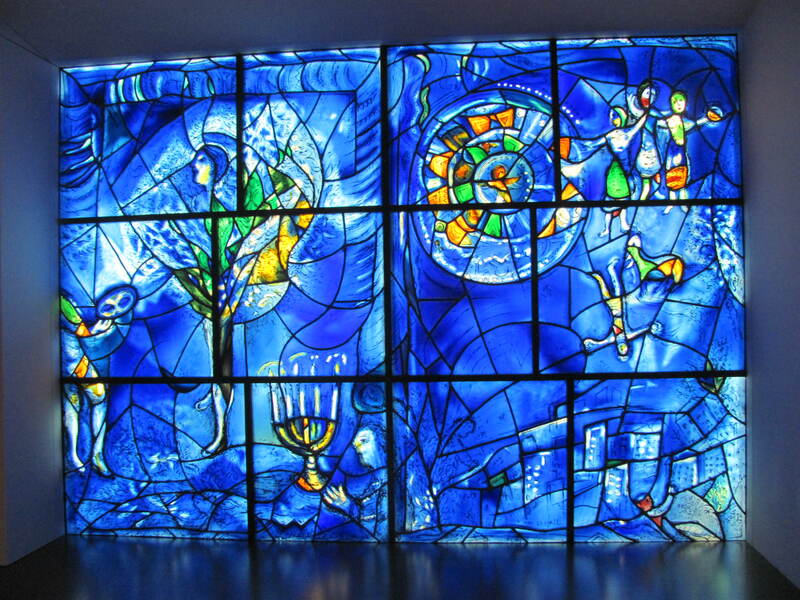 And I am reminded of a trip I took recently to the Art Institute of Chicago. 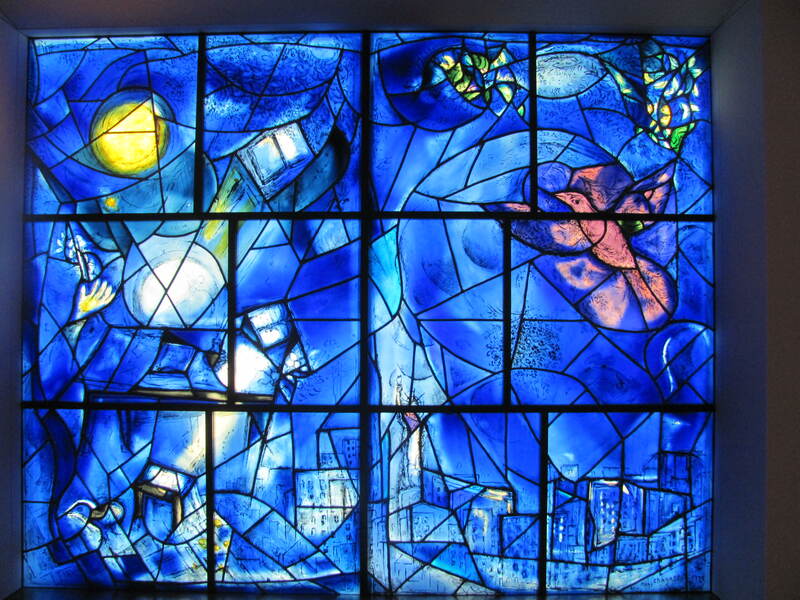 One of the “must sees” that I had planned on this visit were the series of 3 “America Windows” that Marc Chagall created for the American Bicentennial. I will need to weave more blue scarves.